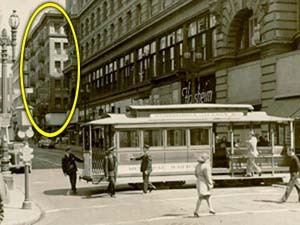 Near the corner of Powell and Ellis Streets are three of the most important Hammett sites in downtown San Francisco. One is the Flood Building, the massive structure where Hammett worked as a Pinkerton Detective. 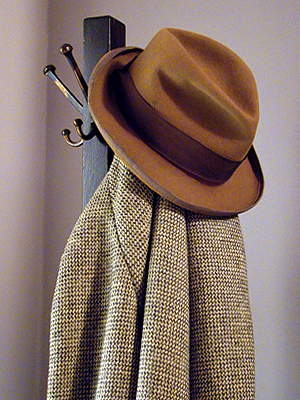 Another is John’s Grill, a favorite of both the fictional Sam Spade and the real-life Hammett. 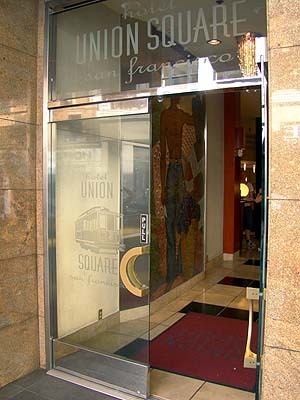 The third is Hotel Union Square. In mid-1921, Dashiell Hammett had just arrived in San Francisco. His health had improved (somewhat) after a punishing battle with Spanish influenza that had developed into TB. He had contacted the local branch of the Pinkerton National Detective Agency, and was again working. Overall, things were looking up. Then Hammett’s fate took a sudden left turn. He learned that Josephine Dolan, the pretty nurse he had met in Washington state during his recovery, was six months pregnant. Hammett quickly proposed marriage, and arranged for Jose to come to San Francisco. In that day and age, it wouldn’t have been proper for the bride-to-be to stay in Hammett’s rented room, so he made a reservation for Jose to stay across the street at Hotel Golden West. About 90 years later, Hotel Union Square (as it is now called) is still in business, and justifiably proud of their Hammett connection. 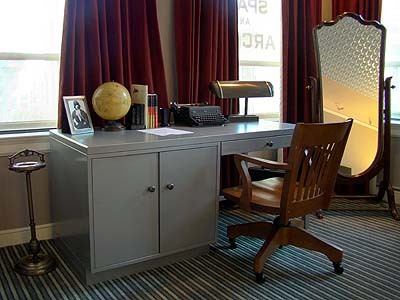 In December 2005, work on the Dashiell Hammett Suite began. 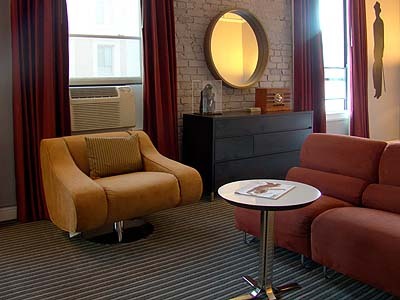 In 2008, Hotel Union Square underwent a five million dollar retrofit, including the Dashiell Hammett Suite. Out were the beige walls and gold curtains, as well as some of the kitchier elements. These recent photos below show the DHS as it looks today. Hotel Union Square, back when it was called the Golden West. In the foreground are the Flood Building, and the Powell Street cable car turntable. The Hotel Union Square, on Powell Street, near Ellis. 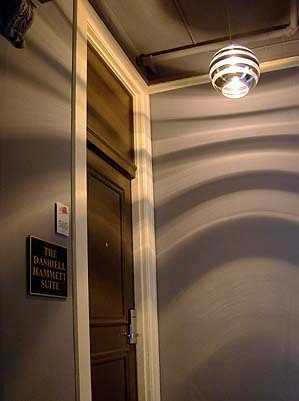 The entrance to room 505, also known as the Dashiell Hammett Suite. Since the 2008 remodel, these striped lamps cast strange, noir-ish shadows in the hallways. SPADE AND ARCHER is stenciled on the fifth-floor window, and a replica of Hammett's desk (including a functioning typewriter) rests next to the wall. The 2008 remodel added new paint, new carpets and new furniture, but the kept the "shadow of the Thin Man" on the wall. 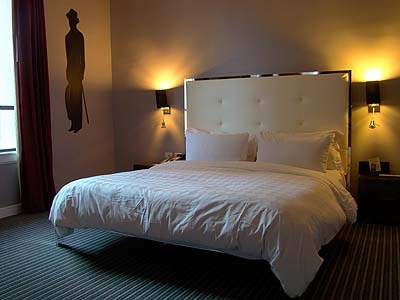 When the Hammett Suite premiered in 2005, it featured twin beds. Later, they were replaced by a single Olympic-sized bed. A flatscreen TV has also been added. 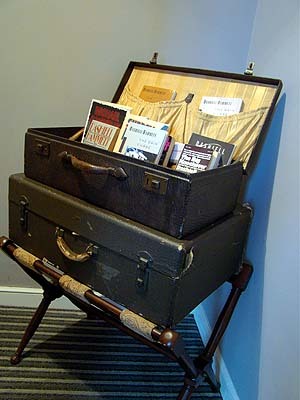 Want to read some Hammett during your stay? Here's a suitcase full! 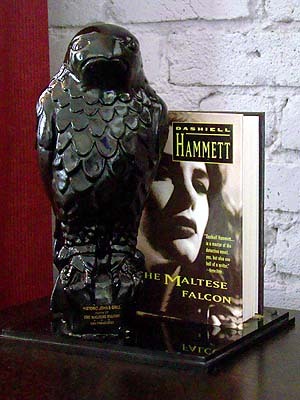 It wouldn't be the Dashiell Hammett Suite without the elusive black bird. 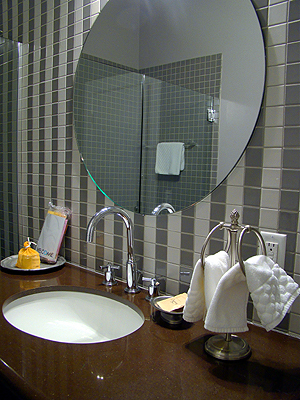 The bathroom was totally redone in 2008, and it undoubtedly a lot spiffier than it was in the 1920s. 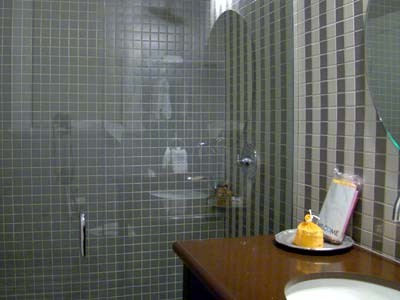 Not for the shy: the glass-walled shower, also added during the remodel.